The Chinese character commonly translated as “stance”, 步 bù, is more properly translated as any of: “step; pace; walk; march; stages in a process.” While the use of “stance” might have been simple and easy, it served to obscure the real utility and focus for consideration of 步 bù. 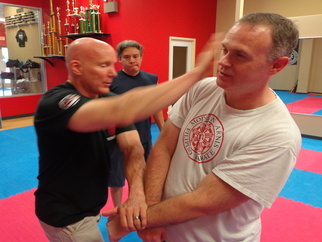 To me, one of the most important purposes and benefits of stance application in martial arts is completely lost if you take the unfortunate translation at face value – the use of motion! In common English, stances are static, starting or ending points, bases from which to fight or move. Steps, on the other hand, are dynamic, with no beginning or end when taken together – stages in a process. In a combat situation, you shouldn’t “fight out of” a stance, rather you should be in a dynamic position, ready to move, to generate and apply power. And that should change freely based upon the circumstances of the moment. Instead of a base from which to fight or move, steps a large part of how you fight or move, in and of themselves. Moving from stance to stance, i.e. stepping (or shifting), gets you out of the way, controls of the relative distance and angle between you and your opponent, helps you manage your balance, generates power for striking, throwing, locking, etc. A fight is a dynamic thing, not posturing and posing – unless maybe you’re an extra in a bad movie! While static stance training can be a great way to strengthen muscles and tendons, feel the optimized structure of a particular position, work on qigong, or even develop a ground path (e.g., zhan zhuan, 站桩), it is the transition to, from, or even within stances that provides most of the leverage for your martial applications. How that leverage is applied is up to you and the details of the situation. Looking at it straightforwardly, stepping or shifting from one stance to another is a way to control distance without sacrificing balance. It can bring you to your target or move you away from an incoming attack. In these cases, angling is paramount so that you can do both at the same time and not only manage distance but also optimize relative positioning. Don’t forget the up and down directions in addition to the left-right and near-far. For example, you can also position for a low attack while avoiding a head shot. Knowing your transitions from stance to stance and having them optimized for your use will allow you to move quickly, effectively, and for optimal positioning. You can also directly apply your stepping or shifting to combat effects in and of themselves. Offensively, use that step as a sweep, a throw, a kick, etc. Conversely, your shifting from stance to stance can itself be used to avoid a sweep, dissolve or reverse a throw, jam a kick or advance, etc. These direct applications of stepping or shifting from stance to stance for positioning and combat use for stepping or shifting from stance to stance are just the tip of the iceberg. Nevertheless, to do these concepts justice using what you already know could (and should!) 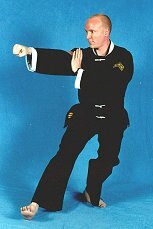 provide you countless hours for exploration before we even begin to look at how to use stepping/shifting more inherently, for all of your martial applications. Before we move on, just for a second, shift your perspective and imagine that the ground is a wall, and it is the only thing you have to brace against if you don’t want Newton’s third law of motion to steal half your power for every direct application you do. If this is the case (and it essentially is), then your connection to what you are bracing yourself against is extremely important to accomplishing your goals. If you brace yourself well then any action you do and any power you generate is transferred specifically to your intended target and not to slipping against the ground, being absorbed by your structure, or otherwise having an equal and opposite reaction affect on you as much as it does your target. Effectively, a good connection with the ground lets you be as one with what you are bracing against (the Earth) such that any force you generate or move you do against an opponent goes completely into them because the ground certainly isn’t going to move! In physics terms, the center of mass is comparatively infinite (the Earth vs. 2 people), so any force you generate against it can only affect your target – or you, if you desire. Correctly executed, you can use your stances and especially your motion through them to make you a mountain of a (hu)man. You make a crucial point in this article, sir. It should be required reading for all traditional martial artists! Keep up the good work!